To describe a new genus and two new species of chewing lice from Southeast Asian trogons (Trogoniformes). These lice belong in the Philopterus-complex. Slide-mounted lice were examined in a light microscope, illustrated by means of a drawing tube, and described using standard procedures. The new genus and species were successfully described. The genus Vinceopterus n. gen. is described from two species of Southeast Asian trogons (Trogoniformes: Harpactes). It presently comprises two species: Vinceopterus erythrocephali n. sp. from three subspecies of the Red-headed Trogon Harpactes erythrocephalus (Gould, 1834), and Vinceopterus mindanensis n. sp. from two subspecies of the Philippine Trogon Harpactes ardens (Temminck, 1826). Vinceopterus belongs to the Philopterus-complex, and thus likely constitutes a genus of head lice. Vinceopterus is the second new genus of chewing lice discovered on Southeast Asian trogons in recent years, the first genus of presumed head lice on trogons worldwide, and the fifth genus of chewing lice known from trogons globally. A translated and revised key to the Philopterus-complex is provided, as well as notes on the various chewing lice genera known from trogons. Work was supported by the Introduction of Full-time High-level Talent Fund of the Guangdong Academy of Sciences grant 2018GDASCX-0809 to DRG, and the Guangdong Forestry Special Project Grant 0877-16GZTP01D060 and National Natural Science Foundation of China grant 31672265 to FZ. We thank two anonymous reviewers who provided valuable comments on an earlier draft of this manuscript. Najer, T., Sychra, O., Literák, I., Procházka, P., Capek, M., Koubek, P. 2012b. Chewing lice (Phthiraptera) from wild birds in Senegal, with descriptions of three new species of the genera Brueelia and Philopteroides. 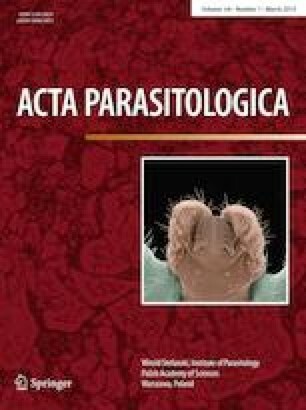 Acta Parasitologica, 57, 90–98. https://doi.org/10.2478/s11686-012-0005-x. Najer, T., Gustafsson, D.R., Sychra, O. 2016. Two new species of Philopteroides (Phthiraptera: Ischnocera: Philopteridae) of the beckeri species-group, from New Guinean painted berrypeckers (Aves: Passeriformes: Paramythiidae). Zootaxa, 4139, 527–541. https://doi.org/10.1164/zootaxa.4139.4.5. Valim, M.P., Palma, R.L. 2013. Three new species of the genus Philopteroides Mey, 2004 (Phthiraptera, Ischnocera, Philopteridae) from New Zealand. ZooKeys, 297, 71–89. https://doi.org/10.3897/zookeys.297.5118. Gustafsson, D.R., Bush, S.E. 2017. Morphological revision of the hyperdiverse Brueelia-complex (Insecta: Phthiraptera: Ischnocera: Philopteridae) with new taxa, checklists and generic key. Zootaxa, 4313, 1–443. https://doi.org/10.11646/zootaxa.4313.1.1. Clay, T. 1951a. An introduction to the avian Ischnocera (Mallophaga): Part I. The Transactions of the Royal Entomological Society of London, 102, 171–194. https://doi.org/10.1111/j.1365-2311.1951.tb00746.x. Mey, E. 1994b. Beziehungen zwischen Larvenmorphologie und Systematik der Adulti bei den Vogel-Ischnozeren (Insecta, Phthiraptera, Ischnocera). Mitteilungen aus dem Zoologischen Museum in Berlin, 70, 3–84. https://doi.org/10.1002/mmnz.19940700102. Valim, M.P., Silveira, L.F. 2014. A new species and five new records of chewing lice (Insecta: Phthiraptera: Ischnocera) from an isolated population of the solitary tinamou Tinamus solitarius (Aves: Tinamiformes). Zootaxa, 3838, 127–142. https://doi.org/10.1146/zootaxa.3838.1.8. Soler Cruz, M.D., Martín Mateo, M.P. 2009. Scanning electron microscopy of legs of two species of sucking lice (Anoplura: Phthiraptera). Micron, 40, 401–408. https://doi.org/10.1016/j.micron.2008.20.001. Clements, J.F., Schulenberg, T.S., Iliff, M.J., Roberson, D., Fredericks, T.A., Sullivan, B.L.,Wood, C.L. 2018. The eBird/Clements checklist of birds of the world: v2018. Available from: http://www.birds.cornell.edu/clementschecklist/download/ (Accessed 29 Oct. 2018). Haeckel, E. 1896. Systematische Phylogenie. 2. Theil. Systematische Phylogenie der wirbellose Thiere (Invertebrata). Verlag von Georg Reiner, Berlin. 720 pp. https://doi.org/10.1514/97831111443935. Moyle, R.G. 2005. Phylogeny and biogeographical history of Trogoniformes, a pantropical bird order. Biological Journal of the Linnean Society, 84, 725–738. https://doi.org/10.1111/j.1095-8312.2005.00435.x. Kristoffersen, A.V. 2002. An early Paleogene trogon (Aves: Trogoniformes) from the Fur Formation, Denmark. Journal of Vertebrate Palaeontology, 22, 661–666. https://doi.org/10.1671/0272-4634(2001)022%5b0661:aeptat%5d2.0.co;2. Mayr, G. 2005. New trogons from the early Tertiary of Germany. Ibis, 147, 512–518. https://doi.org/10.1111/j.1474-919x.2005.00421.x. Mayr, G. 2009. A well-reserved second trogon skeleton (Aves, Trogonidae) from the middle Eocene of Messel, Germany. Palaeobiology and Palaeoenvironments, 89, 1–6. https://doi.org/10.1007/s12549-009-0001-9. Prum, R.O., Berv, J.S., Dornburg, A., Field, D.J., Townsend, J.P., Moriarty Lemmon, E., Lemmon, A.R. 2015. A comprehensive phylogeny of birds (Aves) using targeted next-generation DNA sequencing. Nature, 526, 569–573. https://doi.org/10.1038/nature15697. Espinosa de los Monteros, A. 1998. Phylogenetic relationships among the trogons. The Auk, 115, 937–954. https://doi.org/10.2307/4089512. Johansson, U.S., Ericson, P.G.P. 2004. A re-evaulation of basal phylogenetic relationships within trogons (Aves: Trogonidae) based on nuclear DNA sequences. Journal of Zoological Systematics and Evolutionary Research, 43, 166–173. https://doi.org/10.1111/j.1439-0469.2004.00292.x. Reed, D.L., Smith, V.S., Rogers, A.R., Hammond, S.L., Clayton, D.H. 2004. Molecular genetic analysis of human lice supports direct contact between modern and archaic humans. PLoS Biology, 2, 1972–1983. https://doi.org/10.1371/journal.pbio.0020340. Smith, V.S., Ford, T., Johnson, K.P., Johnson, P.C., Yoshizawa, K., Light, J.E. 2011. Multiple lineages of lice pass through the K–Pg boundary. Biology Letters, 7, 782–785. https://doi.org/10.1098/rsbl.2011.0105. Weiss, R.A. 2009, Apes, lice and prehistory. Journal of Biology, 8, 20. https://doi.org/10.1186/jbiol114. Johnson, K.P., Weckstein, J.D., Witt, C.C., Faucett, R.C., Moyle, R.G. 2002. The perils of using host relationships in parasite taxonomy: phylogeny of the Degeeriella complex. Molecular Phylogenetics and Evolution, 23, 150–157. https://doi.org/10.1016/s1055-7903(02)00014-3. Hosner, P.A., Sheldon, F.H., Lim, H.C., Moyle, R.G. 2010. Phylogeny and biogeography of the Asian trogons (Aves: Trogoniformes) inferred from nuclear and mitochondrial DNA sequences. Molecular Phylogenetics and Evolution, 57, 1219–1225. https://doi.org/10.1016/j.ympev.2010.09.008. Valim, M.P., Weckstein, J.D. 2011. Two new species of Brueelia Kéler, 1936 (Ischnocera, Philopteridae) parasitic on Neotropical trogons (Aves, Trogoniformes). ZooKeys, 128, 1–13. https://doi.org/10.3897/zookeys.128.1583. Bush, S.E., Weckstein, J.D., Gustafsson, D.R., Allen, J., DiBlasi, E., Shreve, S.M., Boldt, R., Skeen, R.H., Johnson, K.P. 2016. Unlocking the black box of feather louse diversity: A molecular phylogeny of the hyper-diverse genus Brueelia. Molecular Phylogenetics and Evolution, 94, 737–751. https://doi.org/10.1016/j.ympev.2015.09.015. Catanach, T.A., Johnson, K.P. 2015. Independent origins of the feather lice (Insecta: Degeeriella) of raptors. Biological Journal of the Linnean Society, 114, 837–847. https://doi.org/10.1111/bij.12453. Weckstein, J.D. 2004. Biogeography explains cophylogenetic patterns in toucan chewing lice. Systematic Biology, 53, 154–164. https://doi.org/10.1080/10635150490265085. Valim, M.P., Palma, R.L. 2015. A new genus and two new species of feather lice (Phthiraptera: Ischnocera: Philopteridae) from New Zealand endemic passerines (Aves: Passeriformes). Zootaxa, 3926, 480–498. https://doi.org/10.11646/zootaxa.3926.4.2.